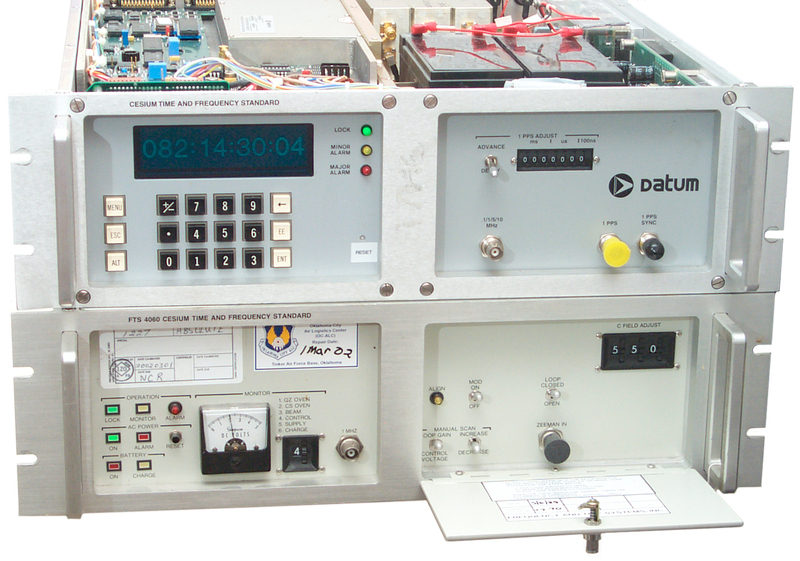 Datum 4065B Cesium Time & Frequency Standard top off showing three 8 Volt batteries. On the right the toggle switch (advance/retard and the 7 thumbwheel switches control the movable 1 PPS output in 100 ns steps. The BNC just below the toggle is the programmable frequency TTL square wave output (.1/1/5/10 MHz). The yellow cap is on the 1 PPS master output. The black cap is on the 1 PPS sync input BNC. Two 7AH Gel Cell 12 Volt Batteries connected while working on the three 8V 5 AH batteries. Just to the right of the line cord jack is a toggle switch which when turned down shuts down all of the unit except for the ion pump. A much better solution to storage than circuit mods. The field of type-N connectors has 3 ea 10 MHz out, 3 ea 5 MHz out and 3 ea 1 MHz out all 1 Vrms, 50 Ohms. The BNC above the DB-9 is the alarm status and the DB-9 is alarm info. The DB-25 is a serial connector for data I/O. This box does not have the optional telecom outputs. The far top right BNC is the master pulse out. Below it is the adjustable offset 1 PPS out. Getting ready to compare them. You can see the family resemblance. Note both units are locked and operational. The 4060 is s/n 1227 and should be fairly close to on frequency. This idea is from the PRS10 Rubidium Frequency standard manual appendix B. Front panel 1 kHz TTL REF OUT to front panel EXT Gate input. CONFIG - press SET to select cAL and press SELECT to choose "cLoc SourcE", use arrow keys to set rEAr. for sine wave 10 MHz inputs set the A and B input fields to: AC, 50 Ohms, Level full CCW, + Slope. MODE to FREQ, SOURCE to B, GATE/ARM to 1 second and SAMPLE SIZE to 1 then hold START down for a few seconds, DISPLAY to MEAN. This will show 1E12 in one second. Now each second there will be a display of 1,000 averaged readings. This brings the 620 precision down to 1 ps. The FTS4060/S24 is really a frequency standard and I've always wanted an excellent time standard. This unit came from an eBay ad showing a Major alarm and not locked. But when powered up it locked in about 10 minutes and after connecting the removed and taped battery wire and waiting an additional 10 minutes the charge fault could be cleared. Each of the three batteries is has four "X" 5 AH cells where each cell is a Cyclon cylindrical sealed lead acid cell. 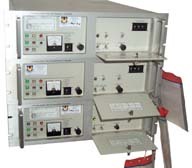 The 2.5 AH "D" cells were used in the O-1814 Rubidium Time & Frequency standard. The top of each battery is marked "bad" and a date of 10-2-01. The voltage across the pack is now 31.2 VDC but there probably is no current flowing if any one cell is bad, so some testing will be needed to see what the real problem is. This is a modern Cesium standard that uses control loops so that it's frequency is correct, i.e. the C-field adjustment is automatic not manual like the 4060. The temperature inside the case is always warm to almost hot. That degrades the life of the lead acid battery by an order of magnitude. If there's any venting, like happened with the Gibbs double oven crystal oscillator, the fumes and heat make a good combination to etch the traces right off printed circuit boards. So, rather than replacing the internal lead acid battery, it will be connected as an external battery. Since a diode OR gate is used to combine the three power supplies a new wire needs to be run to one of the unused pins on the external battery connector to bring out the internal battery terminals to allow float charging. Remote Internal Battery D: -24, E: +24 VDC. Pins D and E on J100 External DC Input were spares and so a true external battery can be added just be wiring it to pins A (positive) and C (return). Note the external battery must have it's own charging circuit and should be at some voltage level chosen by what priority it should be used. On the FTS4065 the C-Field adjustment is made by the internal microprocessor and there is a seperate Frequency Offset adjustment. After plotting for the time interval between the 4065B and GPS from 5 May to 7 May (4065plot9.pdf) and finding a straight line with a slope of 472E-15 the Frequency Offset was changed from +000000 to +000472 (a 50-50 gamble that the sign should be +). A new plot was started 7 May after the change and for the first couple of days seemed to have worked. By starting a new plot I mean that constants were subtracted from the time interval so it starts at 0.0 and the starting second count starts at 0.0. This way is the plot is a straight line it can be forced to go through (0,0). By May 10 at 9:50 am it looked like the frequency offset had worked. The data (plot10a.pdf)was in a box about +/- 10 ns high after 2 3/4 days (3E-13) but more time needed for good data. Then the points started a climb. By 14 May (4 days later) the data between May 10 and 14 looks again like a nice straight line (plot10.pdf)with a slope of about 472E-15. BUT the frequency offset is still set at +000472. (4065BvsGPSp10b.pdf). The 4E-13 number floating on the plot is the slope after one day. Just put it there so I could remember what it was. Excel recomputes the slope as each new data point is added. The 4065 box was rotated 90 degrees and it did make a good sized change. Before this plot was started the frequency offset was stable at 472 (parts in E-15) and the 4065 Frequency Offset was set to +472. For the first couple of days it looked like that change was working and the frequency offset was near zero. But then the frequency offset returned to +472 (this with the Frequency Offset dialed to 472) and that continued for over four days when I turned the 4065 box 90 degrees clockwise (just prior to the day 7 grid line). That made a big change and now (May 17 2008) the slope is more like 167 (parts in E-15). It may be that the Earth's magnetic field is having an influence or maybe just the mechanical shock has the influence. A common misconception (and one that I had until working with a Cesium standard) is that the timing is perfect. This is not the case. A Cesium standard wanders around the nominal frequency, but may not drift like a crystal oscillator. A couple of terms will help when working with this concept. Offset - is a measure of how close to the desired frequency an oscillator is running. For example an oscillator that's supposed to be at exactly 10 MHz is off by 0.0001 Hz has an offset of 1E-11. The offset is only valid at the instant when it was measured. It's measure a of how well someone set the frequency not so much about oscillator quality. Since this is something that's under the user's control a lot of time and effort go into minimizing the offset. It's common practice when setting the frequency of a lab grade crystal oscillator to set it right at the edge of the system spec, but on the side where aging will move the frequency so it at first gets better, then it's perfect, then it moves to the other side of the spec. In order to do this the aging rate (i.e. stability) needs to be known. Note that a Cesium standard may not be set to have a zero offset, but rather most end up with an offset on the order of parts in E13 or E14. The offset is known and can be backed out of measurements on other time standards. But if the Cesium standard will be driving a clock or say a transmitter, the setting the offset to the lowest possible value is important. The key thing is that there is no aging, i.e. a time interval plot vs. GPS will be a straight line whereas a crystal or Rubidium oscillator will have a parabolic plot. Stability - Stability is the money spec. a measure of how well the frequency stays the same. A perfect oscillator would not change frequency with time, power input, temperature, etc., but you can't get that one. The measure of how the frequency changes with running time is called aging. The specification on the HP (Agilent) 5071A Cesium standard ($50k) is less than 1E-14 per day. . That's to say that if it was set with a zero offset at noon today, by tomorrow noon it might by off frequency by 1E-14. The plot at the bottom of web page http://www.niceties.com/utcdwh.html (650 days of data) shows what might be a random walk of around plus and minus 100 ns for an HP 5071A. My s/n 1227 is running at abut -1.4E-14 per day. It would be a tad out of spec for the HP 5071A. Cesium sources are NOT supposed to have aging ike this. Cesium standards are a step better than Rubidium standards and are the basis of the definition of a second. But that does not mean they are "perfect". 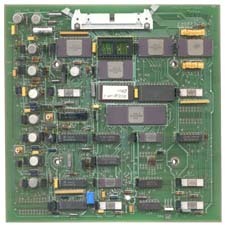 These are the S24 option that has a 1 MHz front panel output, NSN 6625-01-245-3092. The official definition of a second of time is exactly 9,192,631,770 oscillations of a Cesium atom between the F3 and F4 states. 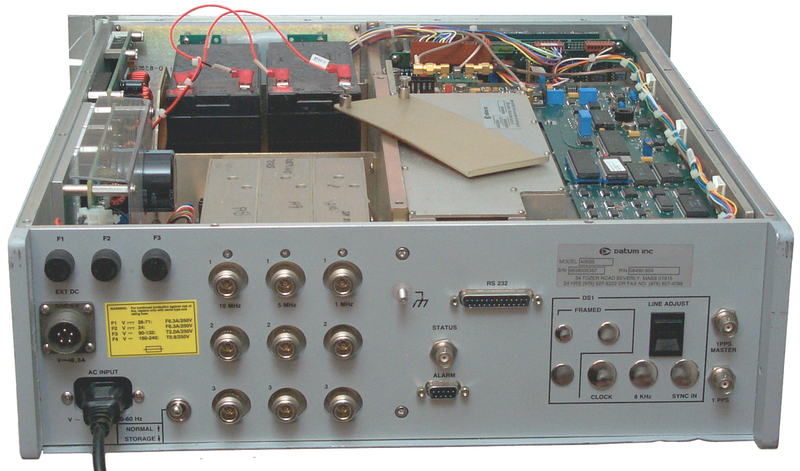 The HP 5060 was probably the first commercial Cesium standard. It was all analog, no microcontrollers then. HP took over the Varian line of Cesium standards. Then when HP and Agilent split, Agilent kept the Time and Frequency instruments and HP then became a computer and imaging company. The FTS4060 I would call a second generation Cesium standard because it has a micro processor that replaces a lot of analog circuitry and is much easier to use. There is a manual C field adjustment that needs to be set where the coarse thumb wheel is 1E-12 per tick and the fine wheel is maybe 1E-14 per tick. Possible meaning: The first control voltage measurement was done at the factory as part of the final inspection and so is close to the ship date. These dates and the serial numbers are in the same order. The front panel date may be when the units were tested prior to being put up for auction. These dates seem to be over 2 years prior to the auction date which may be due to how fast the government surpluses them. Note that it's about 14 years from the final test date to the surplus date. So maybe there is some number of storage years after which these units are surplused, say 15 years. s/n 1013 was shipped outside it's carton and failed to lock when received. 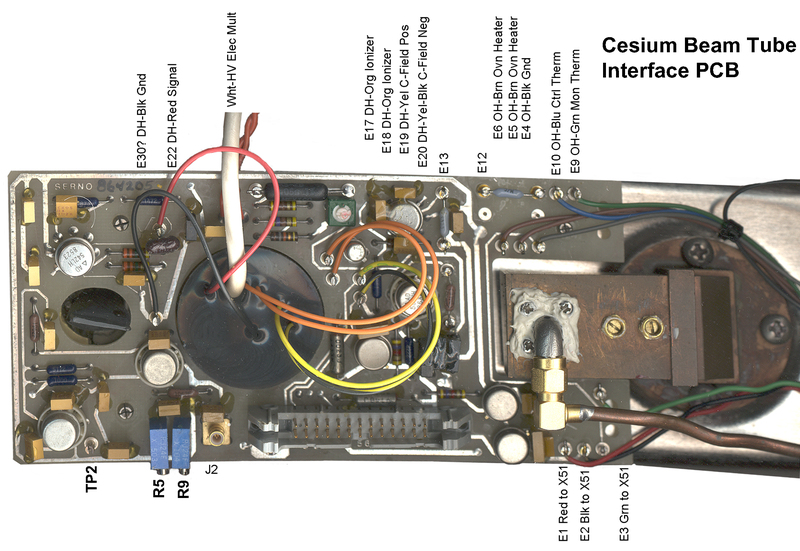 Opening the bottom of s/n 1013 shows the Cesium Beam tube, Brick power supply, and fancy 10 MHz crystal oscillator plus other components. Behind the Cs tube is paper work indicating it was replaced in 1996. There must be some reason that s/n 1013 is not working, need a manual to find it. In the left photo at the top of this page notice that the green "LOCK" light is on for the top two standards (1033 & 1227) and off on the bottom (1013) one. The normal FTS4060 comes in with either a 10 MHz optimized output (/201) or a 5 MHz optimized output (/101). 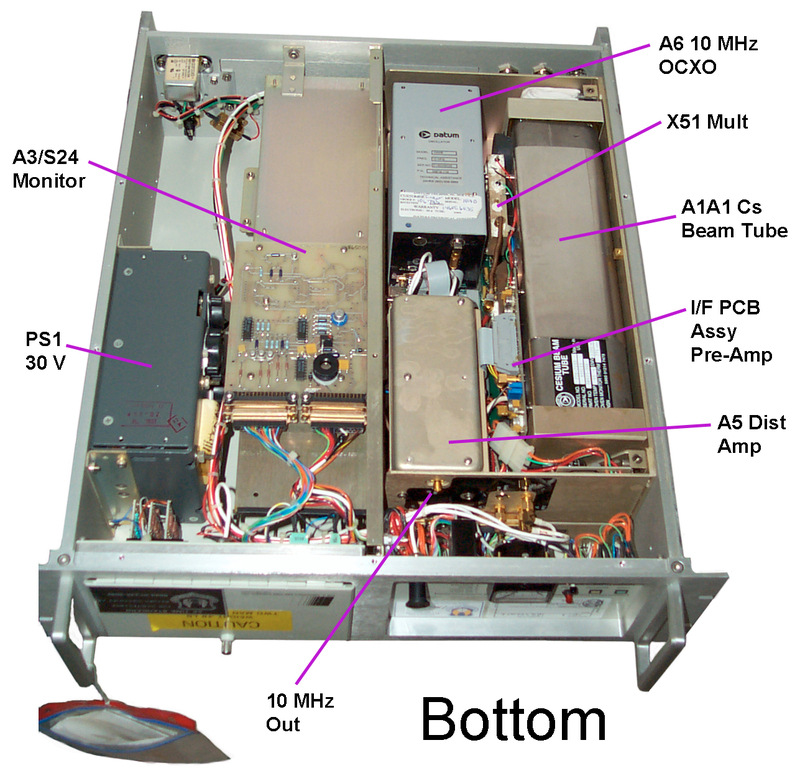 The /S24 option was a special unit made for the U.S. military and has only a 1 Mhz output on the front and rear panels and does not have other frequencies as outputs and does not have the 1 PPS output. It does not have the internal or external DC supply options. It's a stripped down model. 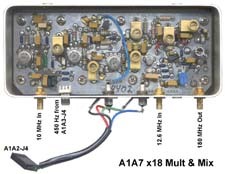 All of my units (s/n 1013, 1033, 1227 have the SMA-f connector on the A5 Distribution Amplifier Assembly, but not all /S24 units have this connector. It's the 10 MHz output at about 4.4 V Pk-Pk. My s/n 1013 has a rear panel with a number of plugs like it was the same rear panel used for a full featured 4060, but s/n 1227 has a solid rear panel with no plugs, so in order to install the 10 MHz port I moved the alarm connector to the inside of the box and replaced it with the 10 MHz output. Note that some FTS 4060 use a 5 MHz OCXO and others use a 10 MHz OCXO. Just plug in the line cord, set the Mod switch to ON and the LOOP switch to CLOSED. After something like 10 minutes to 30 minutes the green LOCK light will turn on and the ALIGN pushbutton-lamp will turn off. You can manually press the Red Operation Alarm Light/Switch to turn it off. Pressing the AC Power Reset switch will turn off the red Alarm light. Pressing the Align Light/Switch may turn it off or initiate a new align sequence. The Voltages shown on the meter have been scaled to fit the meter's 0 to 5 volt range and are not the actual voltages in the circuit. Near the brick power supply on the top side there's a Molex type connector with Red, Black and Orange wires. The connector is the same 4 terminal connector as used for hard drives in PC computers. To get a mating connector buy a "Y" PC power supply cable. You can tease out the male pins using a jeweler's screwdriver if you don't have the extraction tool ( a hollow tube that fits over the male pin). The reassemble with the black wire going to the black ground wire in the FTS4060, Red to the +30 wire and yellow going to the orange +5 volt wire. This makes for an easy way to connect both an external DC backup supply, like the Austron 1290A and also to supply 5 volts for a 1 PPS divider. The 1 MHz signal only allows a TI range of 1 micro second before rollover occurs. MOST IMPORTANT the noise is much higher than it needs to be! By changing the setup so that the FTS4060 10 MHz output feeds the SR620 rear panel Reference Input (and setting the counter to use the external reference frequency) and then using the front panel 1 kHz Reference output as the stop signal two things happen. The rollover time is now 1 milli second (10,000 times longer) and the noise is reduced (probably SQRT(10000) = 100) by a huge amount. With a 1 MHz stop if the TI is between 0 and 200 or between 800 and 1000 there is a chance of rollover points being in the average and between 0 and 100 or between 900 and 1000 it's almost certain that there will be rollover points in the average. Because of this I'm currently slewing s/n 1003 which was at 980 ns and may have an optimum C-field setting of 908 by setting the C-field at 000 where the slew rate may be in the +20 to +40 ps/sec area so it sill take many hours to get the TI to about 500 ns. Note that the 1 kHz out and the cable between Ref Out and B in, have an associated time delay so the TI numbers will not match those with a direct connection. By plotting the offset vs. C-field switch setting it's clear that the slope is -1E-13 per tick. This is also a great way to see which data points are not valid. For example the old data point for C-field setting 492 was +9.8E-13 which is maybe 10 times higher than where it may end up. As of 22 May 2006 it's -6.24E-14 with R2 of 0.84. When R2 gets up to one or two nines, then we'll see. Note that a Cs frequency source is just like any other high stability source and needs to have it's frequency set. The big advantage of Cs is that once set it will not drift like Rb or Quartz. Note this is because of the defination of time, and maybe is not reality. 15 Feb 2005 - The time interval plot was drifting up so an adjustment was made to the C field. It turns out that the adjustment was too large. 24 hours after the adjustment for abut 6 hours the time interval stayed constant within about 10 nano seconds. This indicates that even 24 hours after a C field change the frequency has not stabilized. It really does take two to three days for the unit to stablize after a C-field change. 9 March 2006 - When using a time interval counter where the start signal is the 1 PPS output from a GPS timing receiver and the stop signal is from the 1 MHz output of the FRS4060 the counter has a range of 0 to 1,000 nanoseconds. If the time interval rolls over you get a saw tooth type plot. In order to slew the time interval away from 0 or 1,000 you can set the C field as far as possible from the correct setting. For example on s/n1013 the correct setting will be near 855, so setting to 000 causes the frequency to slew at about 1,400 ns per day which is an offset of 1.6E-11 but you can see to get a 500 ns change will take about 8.5 hours. Not as fast as you would like. There may be other ways to slew, but so far this works. Note that when the C field is misadjusted as much as possible (1.6E-11) the offset is 10 to 100 times better than the best ovenized lab grade crystal oscillators daily aging rate(1E-9 to 1E-10). 11 Dec 2005 - s/n 1013 after complete disassembly and reassembly seems to be working, not like in Jan 2005. Scale Factor = (7.5628 - (-1.7764)) / (900 - 500) = 0.023348 ps/sec or about 2E-14 per click. See framed coment above the scale factor for s/n 1227 is -1E-13 per tick. When making a Time Interval measurement there are different signals that can be used. The common ones are a 1 PPS, 1 MHz or 10 MHz. The big advantage of the 1 PPS signal is that it takes a long time for a 1 second rollover. If the TI counter is triggered with a 1 PPS pulse (like from the PSR10 Rb source) and the 1 MHz output from the /S24 Cs source is used as the stop signal to the SR620 then the data will have a range of 0 to 1 micro second. (i.e. the period of the 1 MHz signal). If the Cs source can be off by as much as 1000 counts where each count is 1E-13 then it might be off by as much as 1E-10. When the 1 MHz output is used as the stop signal then rollover might occur every 1000 seconds. This means that the TI needs to be measured a number of times inside each 1000 second period. You can not just measure at times seperated by 24 hours when the source stability might be as bad as 1E-10. If a 1 PPS stop signal was available from the Cs source then there would be no rollover problem since a source with 1E-10 stability will only drift 8.6 micro seconds in 24 hours. I have a WWV clock and when the 1 PPS from the PRS10 is used to trigger the A counter input the counter trigger LED is flashing at exactly (as seen by eye) that same time as the WWV clock changes seconds. This makes it easy to tell which reading is axactly on the minute for manual recoring into an Excell spreadsheet. WRONG #1- Since the saw tooth error is symetrical it gets removed when averaging is done. On a 500 second average using the GPS 1 PPS as the start and the SR620 1 kHz Reference Out as the stop the standard deviation on the group of 500 is right at 9 nano seconds, but the mean value is independent of the sawtooth error. WRONG #2 - 50 ns is the saw tooth size for the older 8 channel Motorola timing GPS receivers, but the M12+T only has a 9 ns saw tooth. If the time interval has a positive slope then the period of the FTS4060 is increasing and so to reduce the period the frequency should be increased and so the thumb wheel switches should be moved to a higher number. This is for the case where start is GPS and stop is the FTS4060. One way to adjust the C field 3 digit thumb wheel pot is to use GPS. Although there is some jitter on the GPS 1 PPS signal that amounts to maybe plus and minus 50 ns (Motorola 8 chan), the accuracy over a 24 hour period is on the order of 1E-12. The Motorola M12+T has about 9 ns and so is much better. The GPS receiver should be used directly. Also there a lot of jitter on the 1 MHz FTS4060 output, much better to divide it down to 1 kHz or 1 PPS. It seems that the scale factor for the /S24 using is 1E-13 per count NOT the 2E-14 in the normal FTS4060 manual. 10 Jan 2005 - Plot of nano seconds of Time Interval vs seconds of running time for s/n 1013 - 5.9E-12? 12 Jan 2005 - Plot - Between 124,920 and 169,680 (12.4 hours) the 1 PPS input to the PRS10 was removed and when reconnected caused a negative swing that lasted until 248,400 seconds. But it appears that a C-Field setting of 913 is pretty close to correct. The drift is in the e-13 ot E-14 area. 18 Jan 2005 - Plot of s/n1013 vs. s/n 1227, 1227 vs GPS & 1013 vs GPS, now using s/n 1227 as 10 MHz ref for SR 620 counter. s/n 1227 has it's C Field set at 600 as received from Govt Liq. and it appears to be moving at -3.6E-12. s/n 1013 seems to be moving at 5E-10 more like an OCXO than a Cesium, but the Lock LED is on and the beam current peaks as it should. What wrong? 1 Feb 2005 - s/n 1227 - I tried to use the time interval between GPS and the 1 Mhz output to set the C Field by getting the offset and then dialing in the correction (it looked like the three thumb wheels were 1E-12, 1E-13 and 1E-14), but the resulting slope after a few days of observation seemed to overshoot. A better way would be to use a binary search where at each attempt you would half the error. I think I have the setting to within a single count on the finest wheel, but it'll take some days to see. 10 Feb 2005 - s.n 1227 - Still have C field at 544. The 10 day plot shows GPS wandering within a 150 ns range so the poorest stability might be 1.7E-13, but an average would be more like parts in E-14. 10 Feb 2005 - Enabled Ionospheric correction in GPS receiver and the delta time jumped up to the 500 ns range, so this may account for the 100 or or ns variation the last 10 days. More time will tell. 11 Feb 2005 - changed GPS to track 4 highest satellites and changed elevation mask to 30 degrees. It's very important that the GPS receiver is properly setup to get the best timing results. 28 Feb 2005 - The C field has been at 570 for about 9 days and on average there does not appear to be any drift, but it's difficult to tell. 2 March 2005 - To improve the stability of the GPS 1 PPS I increased the elevation mask again, this time from 30 degrees to 50 degrees. It has made a big improvement. The standard deviation after 1,000 seconds worth of 1 PPS averaging is now in the 30 ns area where before it was in the 200 ns area. During 3 days of observation there never was a time when there were no satellites above 50 degrees. Since I'm running the GPS receiver in the timing mode (known antenna position) only one satellite is needed for a timing solution. 8 March 2005 - C filed at 565 - After the problem with the 4060 going crazy after a beam current centering. Needed to cycle power to get good operation. 13 March 2005 - Yesterday the counter got unplugged, but neigher the FTS4060 nor the Austron 2100T were unplugged. Both of these instruments have warning LEDs that would indicate a loss of mains power, but the FTS-4060 output frequency became more unstable after this event. This morning I unplugged the FTS4060 for 10 seconds and restarted it. After that the standard deviation on the time interval improved from over 300 ns to more like 30 ns. Maybe there are some power supply caps that need replacing or more caps need to be added? (3 * 35 ns * 2) / (SQRT(1,000) * 86400) = 7.6E-14, but by going to 5,000 seconds the system improves to 3.4E-14. So starting a new plot. 15 April 2005 - Switched to an SynPaQ/III with Motorola M12+T GPS receiver. This unit has 3 to 4 times less variation than the old 8 channel UT+ GPS receiver. But there appears to be a parabolic change in the plot over the past 5 weeks that I don't understand. The C filed has been at 568 since 20 March 2005. 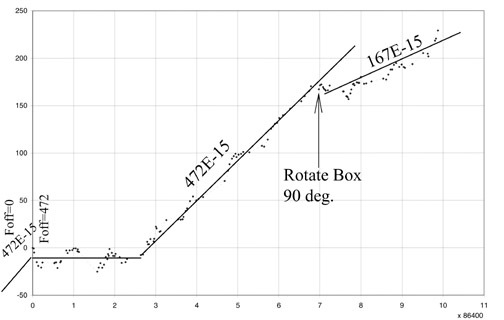 28 April 2005 - the plot for s/n 1227 vs both GPS and Loran-C still appears to be parabolic, indicating some type of aging which is NOT supposed to occur whith a Cesium source. Aging is about -3E-14 per day. 29 April 2005 - the aging rate seems to be slowing down. It's now -2.2E-14/day. 1 Feb 2006 - s/n 1013 seems to be working after having all the modules taken apart (working on technical manual) and then put back toghther again on 9 Dec 2005. Changing the C-field causes a change that takes about a week to settle down (now C=850) and for the last few days the 1 PPS has stayed within about 1 ns of the Motorola M12+T pulse (maybe 1ns/3 days = 4E-14). R2 = 0.9088. The x-axis is in days and the y-axis is in ns. The first deritive of the equation has a first term of 2 * 2.7943 * x ns/day or +5.3E-14 drift rate. I don't know if this is a measurement problem or a problem with the FTS4060 standards. 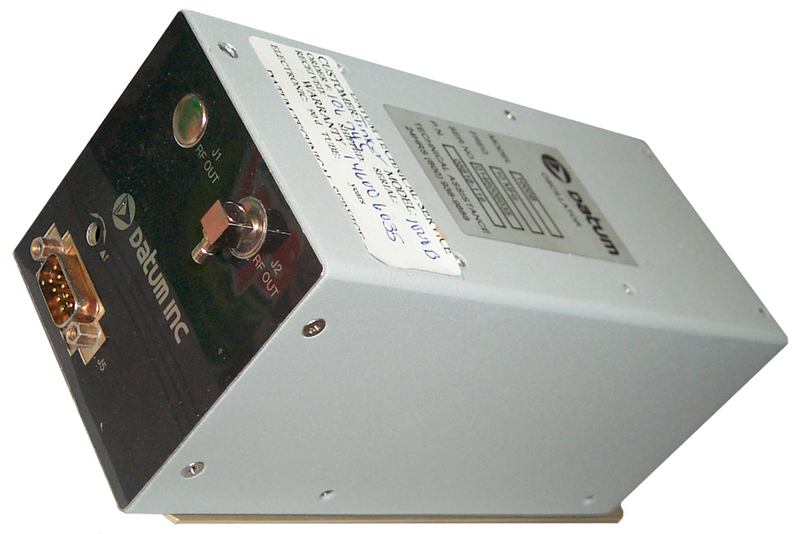 9 March 2006 - The apparent parabolic aging was a measurement problem related to setting the time interval counter trigger level improperly (50 Ohm source and load TTL should be at 1.25 Volts, NOT 2.4 volts). Now s/n 1013 is looking very good. Another problem may have been that the Ultra Stable Oscillator coarse frequency was not set properly. It now has been centered and now looks like +4E-13 offset which I'm trying to adjust to be much better. GPS has some noise. For example the Motorola M12T+ has a standard deviation of about 9 ns when 500 Time Inteval readings are averaged (reference is some good oscillator). So you might expect that the noise will peak +3 sigma and -3 sigma from the mean value. This means that the offset you can see is about 54ns/(measurement time in seconds). When plotting Time Intervals in Excel you can fit a trendline and also get an R squared quality of fit number. R^2 should be some number of nines for a good fit. If it's not then there's something wrong. multipath may cause a problem if there was only one or two sats visable, but I would think with 3 or more visable a poor satellite would not cause a problem? some problem with the SR620 - I have disconnected the PRS10 as the external ref since it's not needed and between the PRS10, it's power supply, GPS receiver there's just that much more to go wrong. But this has not seemed t make any difference. The problem was that the data was getting near the 1,000 uS rollover point caused by using a 1 Mhz signal for the counter B (stop) input. Instead of connecting the cesium 1 MHz signal to the B input, connect the 10 MHz signal to the counter's rear panel 10 Mhz input. Use SEL, SET & SCALE^V to enable rear clock input. Then connect the front panel 1 kHz Reference TTL output to the B (stop) input. Now the rollover will be every 1 mS, or a thousand times improvement. If you're using Julian Day numbers (maybe 6 digits) and have less that 20% of the JDN worth of data, the Excel trend line will be in error. Much better to subtract a very large constant from the JDN so that the x-axis starts from zero. This way the trend line is correct. The number of data points should be the same on either side of a straight trend line. In my case ALL the data points were on one side of the line. 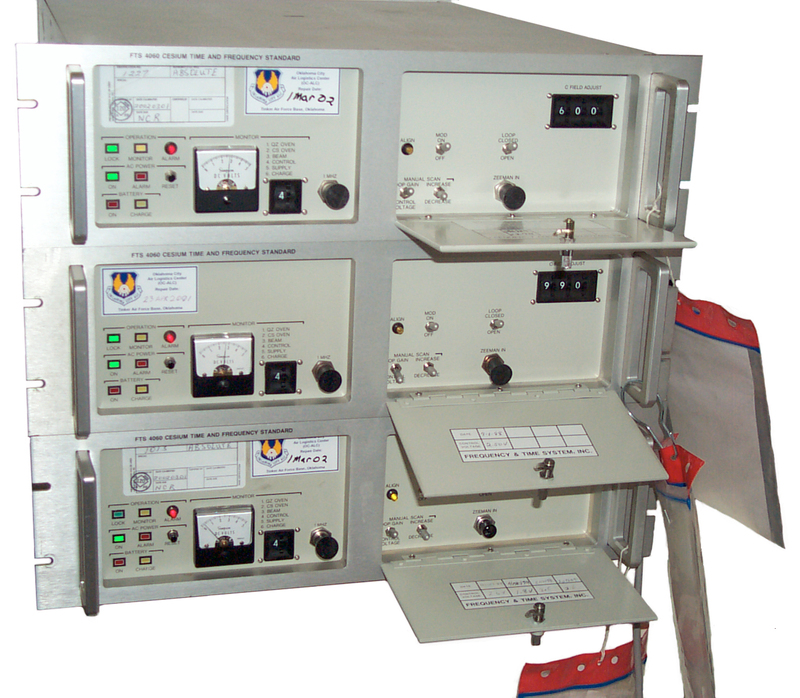 The LORAN-C system will continue and will be improved (2005) and offers a high quality time transfer capability. The Austron 2100F or 2100T will work for this application. The HP 5060A manual says the Zeeman frequency should be 42.82 kHz and about 1 volt RMS. And that an error in the Zeeman signal of 1% translates into a Cs frequency error of 3.6E-12, so it needs to be set to within about 1 Hz. The amplitude of the Zeeman signal and the C-Field can be adjusted, with the modulation off and the loop open to set the C-Field, or the C-Field can be measured by adjusting the frequency and amplitude of the Zeeman input to get maximum beam current. Mr. Pieter Zeeman won the Nobel prize in Lecture 1902 along with Mr. Lorentz for explaining a splitting in the spectral lines of light caused by magnetic fields. This explanation was based on the new things called "electrons", but did not take into account quantum effects like up and down spins. His experiments and the theory by Lorentz shed a lot of light on what an "electron" was. So far I don't have an audio generator that has the required frequency settability AND enough drive power to do this test. 9192.631770 MHz. Real Cesium tubes run with a very small magnetic field and so their frequency is slightly off that for a standard second, but the manufacturer knows how far off and allows for it so that the final 10 MHz or 1 PPS is exactly correct. Note 1 - The C field coils in both HP and FTS Cesium tubes have the same milli gauss per milli amp constant and so the C field is determined by how the main frame is setup. Note 2- The synthesizer that generates the frequency that's fed to the multiplier is also in the main frame and has a frequency that matches the strength of the C field. Note that as long as the C field and synthesizer are matched to each other the system should work properly. Today, 15 June 2006, thre was a scheduled power outage whicl PG&E replaced a power pole. 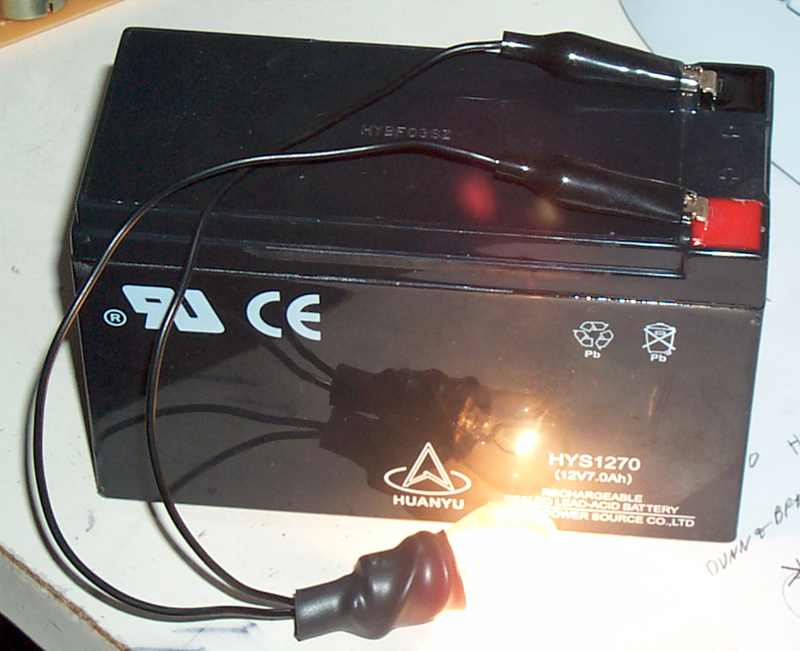 Since I still have not got the Austron 1290 Back Up power supply operational, I juse connected a couple of 12 Volt 7 AH gel cell batteries in series with a SB360 Schottky diode. Using the male plug from a PC hard drive power supply "Y" cable with the pins reinstalled so that black goes to black (ground) and red goes to +30 and Yellow goes to orange (+5) and with the diode cathode to the 4060 + 30 volt line the batteries held up the 4060 for the 3 hours the mains power was down. Now I have removed the batteries and a charging them manually with a bench supply. The 12V 7 AH lead acid batteries are 3.75" from the bottom to the top of the metal terminals. The distance from the bottom of the battery shelf to the bottom of the lid is about 3.75", so it would be a bad idea to try and close the lid with the batteries inside. And there's an even more compelling reason to NOT put lead acid batteries in the same box as electronics. And that's because acid fumes from the lead acid battery will literally eat the traces off the printed circuit boards. So it's best if the batteries are out of the 4060. It took about 2.7 AH to charge one of the 12 V 7 AH batteries and the power outage was about 2.7 hours, so the FTS4060 is pulling about 1 Amp. But the 7 AH rating is for a 20 hour discharge (350 ma) so the battery will not last 7 hours at 1 amp. I think the terminal voltage at the end of the power outage was about 23.49 volts or 11.75 volts per battery which is discharged. Maybe 2.7 AH is the capacity at 1 amp? When running from the batteries the Green Lock LED is on and the red AC Power Alarm LED is on as well as the red Battery LED. But monitor position 6 still shows 0 because there is no charging current. After AC power is restored the Power On Green and the red Powere Alarm are both on (press the reset button to clear the red alarm LED). At first one of the new batteries not only would not put out any voltage, but actually had reverse voltage across it and the 4060 was still running. This means that the switching supply will keep the 4060 going on less than 12 volts (although it may or may not start a cold 4060 on that low a voltage). The "bad" battery looked just like the good batteries when connected to the charging power supply. So now I have made up a simple 12 Volt battery checker that's just a number 1156 car tail light bulb soldered to a clip lead that was cut in half. This pulls a couple of amps to light brightly and with only 1 amp will take some seconds to light dimly. This works much better than the Radio Shack 22-080 battery tester that shows a dead battery as good. 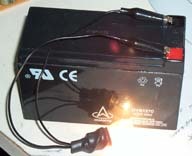 Note that the very common 12 V 7 AH batteries come with both 1/4" (0.250") and 3/16" (0.187) quick connect type terminals. On the batteries I got some are 1/4" and some are 3/16". So you need to check each battery, even though at a quick glance they look the same. Under the top cover the brick power supply is on the right. Beside it is a tray that could hold rechargeable batteries. There's a 4 position Molex connector with 3 sockets installed on wires that are Red, Black and Orange marked "26" that's probably the battery pack connector. There is a PCB behind the left metered panel and another PCB behind the setup controls located behind the door on the right. Chicago Miniature CMD series LED's. The upper left box is marked Model 5030M/201/S25, s/n 199, U.S. Patent 4499433. A system is disclosed for examining the response in atomic and molecular resonators to identify and select the maximum resonant peak and the voltage used to cause said peak to be produced. 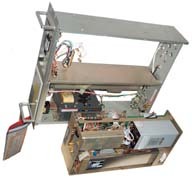 The system is fabricated of modular elements electrically connected to a circuit board to facilitate its construction and transportation with the resonator. A microprocessor is utilized to perform the analysis and to generate information to select the maximum resonant peak, and the system includes means to compare the value of successively generated resonator outputs and to select the output with the maximum peak. The idea of this invention is to use a microcontroller (RCA or Hughes 1802 CMOS) to sweep the control voltage to the 10 MHz OCXO across it's range and watch the CBT output peaks and valleys. By looking for a peak with aproximate equal valued adajacent valleys on both sides the maximum peak can be selected and that peak used to lock the servo system tying to CBT to the 10 MHz reference. The three DAC1006 Digital to Analog converter chips that are part of the A/D system reading the CBT output voltage is potted in a clear compound probably to reduce elakage currents. J2 is the OCXO control voltage output. "Moreover, in rubidium frequency standards, the available C-field adjustment range limits the useful life of the unit. For example, in one of the most popular rubidium frequency standards currently on the market, the manufacturer provides a C-field adjustment range equivalent to +1.5.times.10.sup.-9. The aging rate of the standard is specified as 2.times.10.sup.-10 per year. Consequently, at the specified aging rate, the limited C-field adjustment range limits the useful life of this rubidium frequency standard to 1.5.times.10.sup.-9 /2.times.10.sup.-10 =7.5 years." J3 is the signal coming from the I/F PCB of the CBT. J4 is the 450 Hz output to the A7 X18 multiplier. At the left rear is the microcontroller PCB. There is a 40 conductor ribbon cable connection, 2 coax cables and a cable with 2 wires (Red and Black) going to A7 and TP2. 2:56 Operation Monitor light turned off. 3:00 switching LOOP to Open and back to closed starts meter into sawtooth from 0 to 5 Volts. It takes about 21 seconds to sweep the monitor voltage from 0 to 5 Volts. But TP2 is sitting at 4.98 VDC so must be a 5 Volt test point or it's some logic indicator that may be pointing to a problem. 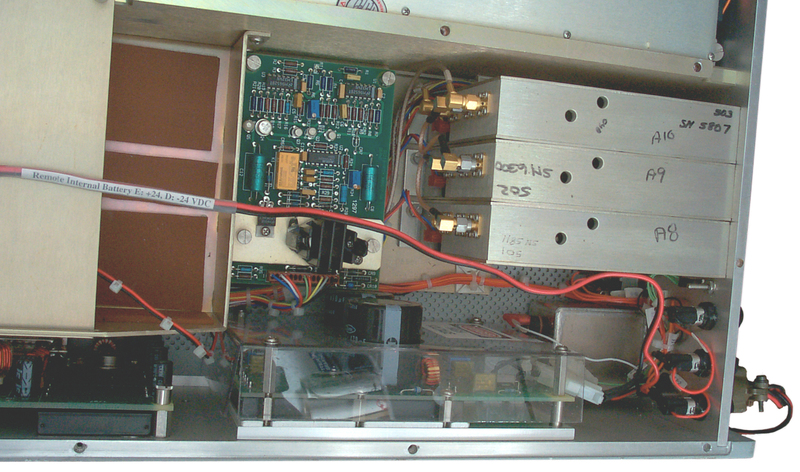 21 July 2005 - A3-TP2 a test point to monitor the 450 Hz signal that goes to A7. The Cesium Beam Tube is on the right, marked: Cesium Beam Tube, Model FTS-7103, p/n 08923-501, NSN 5960-01-214-7475. To the left of the CBT at the rear is the 10 MHz oscillaotr, marked: Model 1000B. In front of the 10 MHz osc. 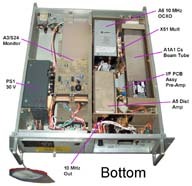 is The A5 Distrubution Amp metal box with an SMA-f connector just behind the front panel marked J3, RF1 which may be a 10 MHz signal that could be connected to the front or rear panels. Just to the left of the center divider is the A3 Alarm PCB with 2 each DB-25 connectors and no RF coax connections. Marked: D.1652 s/n 865009 (probably 1986 +...) It is not fully populated, missing a few ICs and a number of discrete parts that probably are part of the battery charging or monitoring circuit. The 30 VDC brick power supply is up aginst the left wall. I have named the DB-25m connector nearer the powr supply A3J1 and the DB-25m near the center divider A3J2 since there's no markings on either. 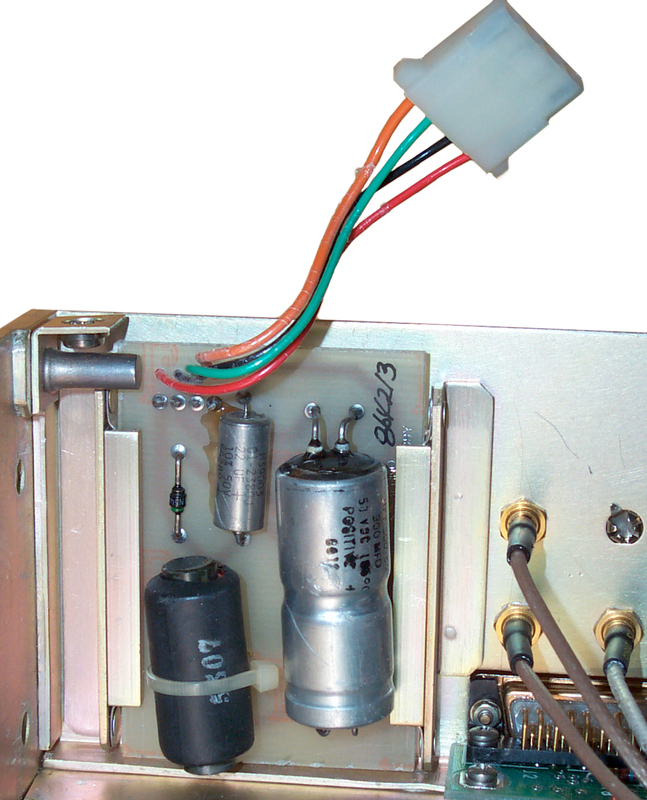 A3J1 pins 23, 22, 24, 25, 2 and 6 are connected to the Monitor thumb wheel switch positions 1 thorough 6 respectively and the switch common goes through the front panel meter to ground. The Battery Charge, AC Power Alrarm, Battery On andAC Power On LEDs are connected to A3J1 pins 4, 5, 6 and 9 respectively. Five of the wires on A3J2 are connected to the 5030 Assembly J1 connector. A3J1 pins 1, 13 and 18 and connected to A3J2 pins 1,2,5,6,8,13 which is probably ground. 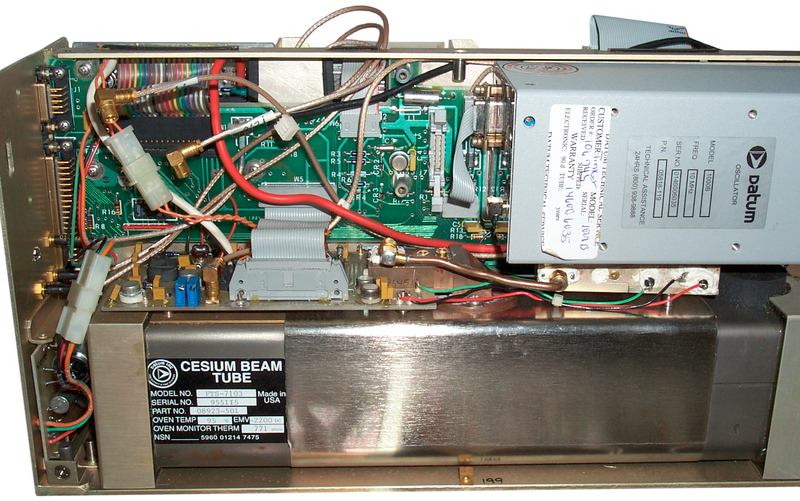 The Physics package might be defined as the combination of the Cesium beam tube, the Times 51 Multiplier and the Interface PCB since the latter two items are bolted to the side of the Cesium Beam Tube. The Physics Package is in turn a part of the 5030 Assembly. 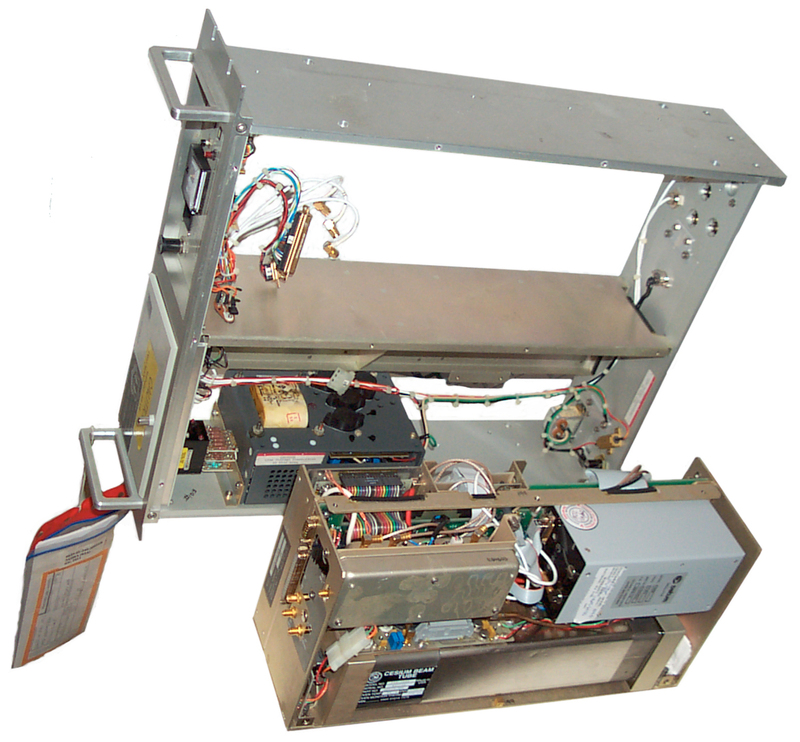 In addition to the Physics Package the 5030 assembly has Most of the parts except the PS1 30 Volt power supply and the A3 Alarm 5 x 6" PCB, and the front and rear panels. The 5030 Assembly is 16 x 7.75 x 5 inches. To remove the 5030 Assembly remove the four 5/32" hex cap bolts, being careful to not let the 5030 assembly crash and move it so that you can easily get to the SMA connectors and the #2 Philips screws on the "D" connectors. Check to see that the 3 Coax cables are marked 4 (Zeeman audio in), 5 (Rear 1 MHz out) and 7(Front 1 MHz out) that mate to J4, J5 and J7, then disconnect these SMA cables. Remove the two "D" connectors using a #2 Philips screwdriver and lift the 5030 Assembly free of the chassis. 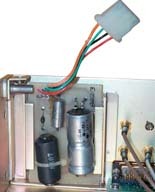 Note It is an easy job to replace the 5030 Assembly and that may allow using the complete 5030 Assembly from a working /S24 unit to bring a defunct FTS4060 back on line. This can be done in a few minutes. But I don't know where the additional modules are located on a full featured 4060. If they are on the right side ( the 5030 is on the left side) then it would be very easy. If they are in the way of removing the 5030 Assembly then it would take longer. On the upper left is the 10 MHz OCXO. 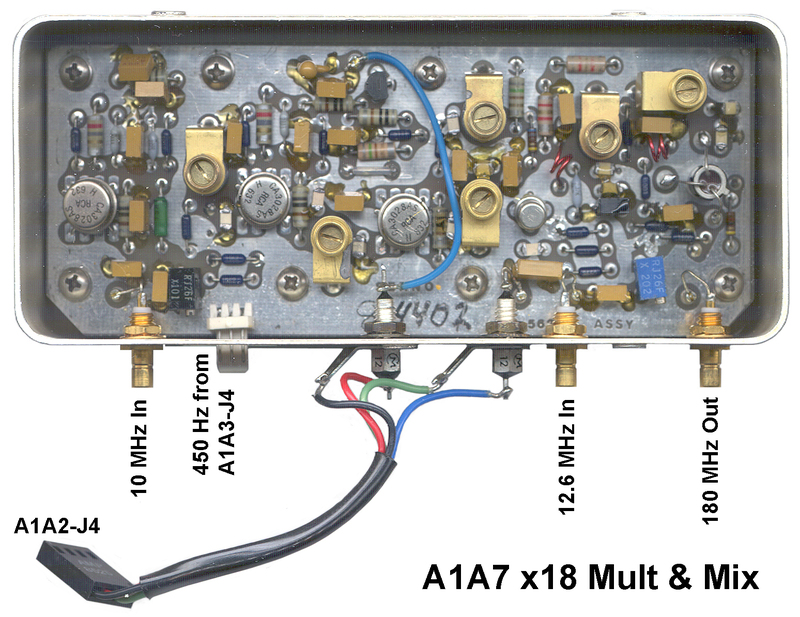 At the upper right is the A5 Distribution Amplifier. This amy be an A5/S24 with the front 10 Mhz output missing. By first labeling all the coax cable ends that will be disconnected, then by removing 2 (+) screws and loosening 2 (-) captive screws and disconnecting some connectors (no soldering needed) the combined A5 & A7 assembly can easily be removed. My units have an A5 amplifier that has a open SMA-f connector facing forward and that connector has a 10 MHz signal that's about 4.4 Volts Pk-Pk. But other /S24 units have the connector and some internal parts removed and so don't have the 10 MHz easy to connect. The 5030 assembly mother board can be seen once the A5+A7 sub assembly is removed. 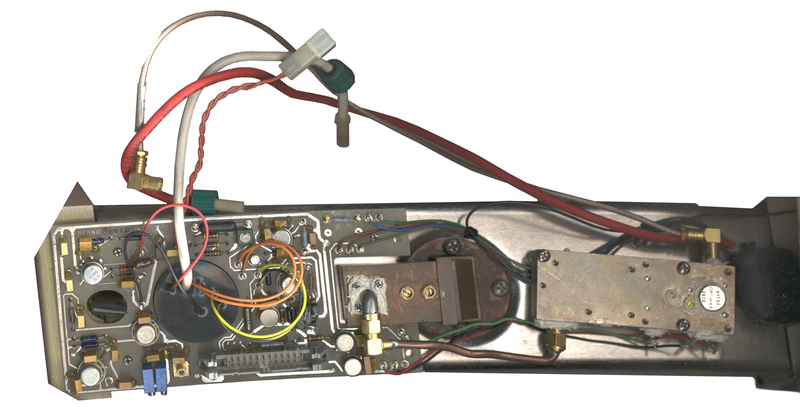 All the components in the 5030 assembly interface to the mother board. This greatly minimizes the wiring clutter. There may be a dozen components on the mother board. Max dimensions are about 12" x 5" although it's "L" shaped. Here only the A1A2 motherboard and the A1A9 input filter at attached to the 5030 frame. The right hand narrow part is just to get the 40 conductor ribbon cable lined up with the A1A3 uP board. The oven insulation is my means of a dewar. The initial aging rate might be <1E-10 per day when new, but can get below 1E-12 after running for some time. The phase noise is lower than -134 dB at 10 Hz, -144 dB at 100 Hz and -157 dB at 1 kHz. The 10 Mhz output is from a right angle SMB connector pointing down. (All the small coax is terminated with 50 Ohm SMB connectors in the FTS4060). On top of the 1000B (p/n 05818-119) there's a coarse frequency adjust pot. To remove the USO three 1/4" nuts need to be removed that are below the A3 uP board and the connectors disconnected. Just under the A5 Amplifier is the Times 18 Frequency Multiplier (10 MHz in, 180 MHz out) and mixer. As seen in the photo the connectors are: 10 MHz in, connector with Black, Gnd, and Red wires going to J4 on the A3 Microprocessor board. Cable with Black, Red, Green (ground) & blue wires soldered to feedthroughs going to connector J4 on Cesium Beam Tube motherboard.. 12.6 MHz input & 180 MHz output. 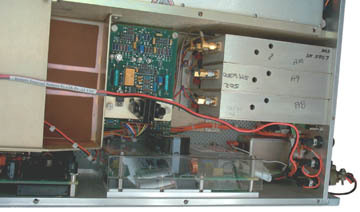 In the lower right corner is the A8 Power Supply for the Cesium Beam Tube that includes the two HIGH VOLTAGE outputs. 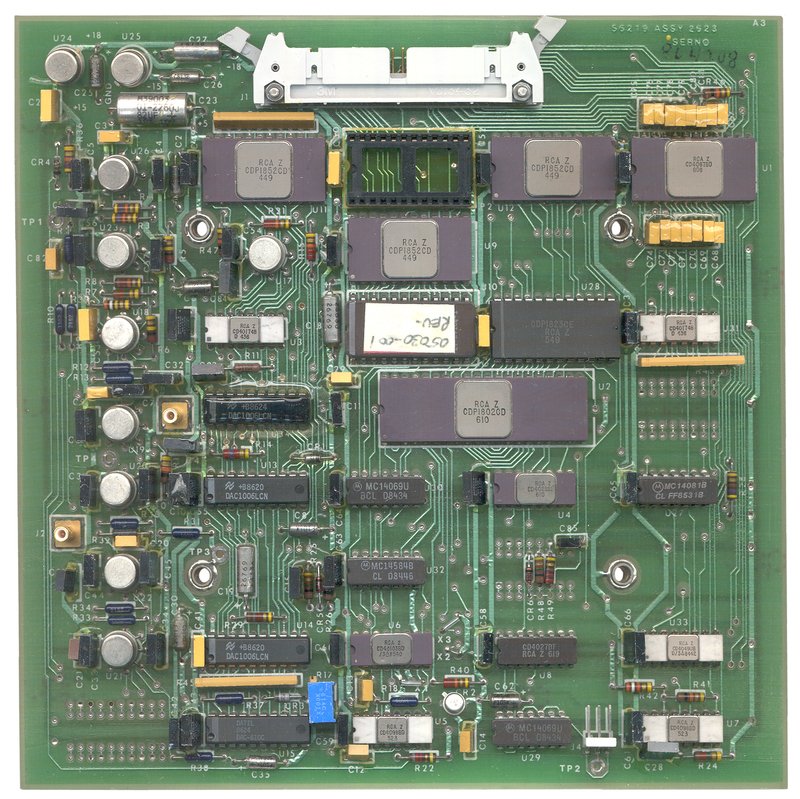 The bottom of this PCB is visible at the top left front when the top cover is removed. You might not want to have your hands anywhere near this board when power is applied. Although this PCB is in a slot and should be able to slide out, it's trapped by the female thread fitting used to attach the 5030 sub assembly to the chassis. It has a dual electrolytic cap, a single electrolytic cap, a diode and an inductor. 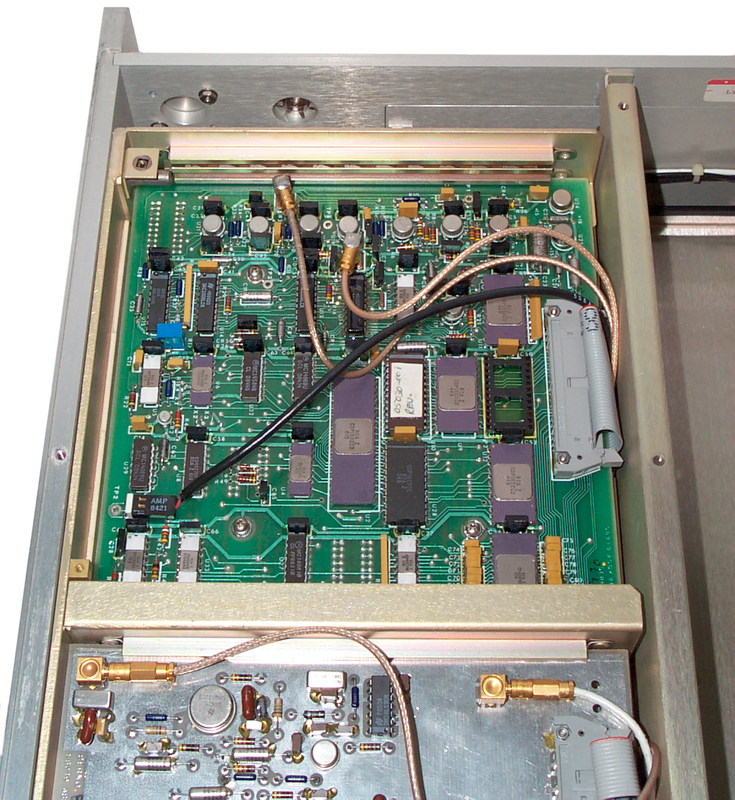 At the bottom center is the 3 x 7" A2/S24 RF Assembly (56219-05280-011 Assy 05281) that takes in 10 MHz and outputs 1 MHz. 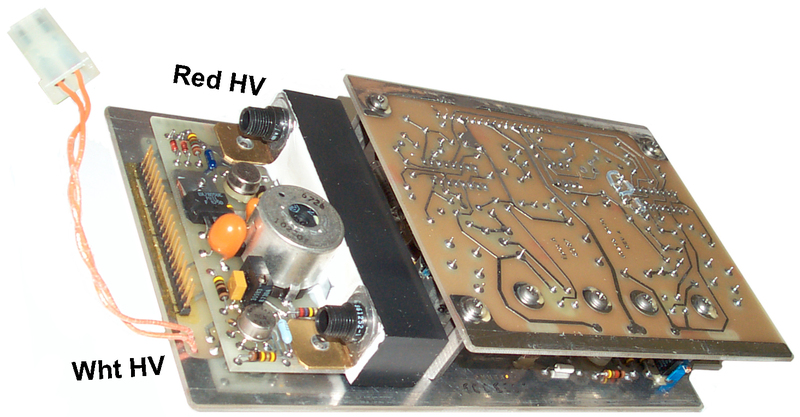 On a full featured 4060 this board would also output 100 kHz and 10 MHz. It may that the 74LS90 divide by 10 circuit could be bypassed to allow two 10 MHz outputs instead of the two 1 MHz outputs that are on the /S24 versions. The A3 board has a coax input (J2) that takes in the error signal from the Cs interface board. 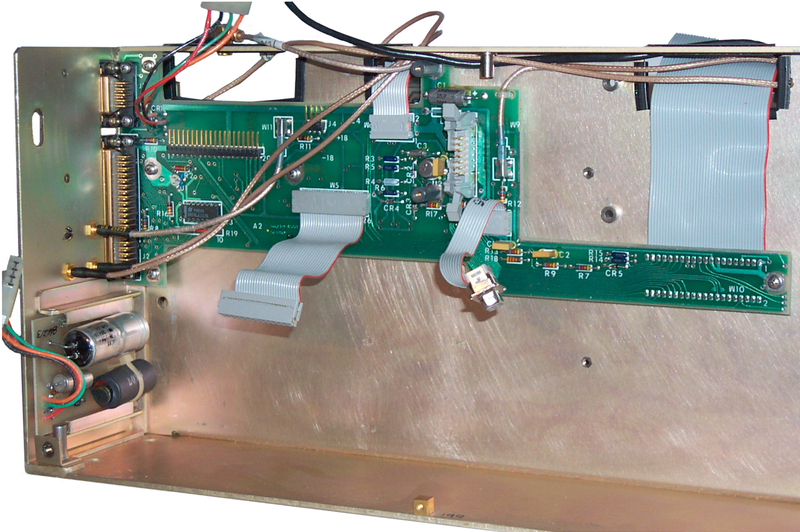 It also has a coax EFT output (J3) to drive the Ultra-stable 10 MHz oscillator (A6). The 450 Hz signal is generated on this board and feeds A7. 40 pin connector J1 has a number of analog signal inputs and outputs as will as digital inputs and outputs. With J1 pointing up in the photo at left the two TO-5 cans in the upper left are the +15 and -15 volt supplies for the analog Op amps, sample/hold and DAC circuits comprsing the left analog part fo the board. The uP is an 1802. DAC1006 D/A converters are used both for A/D conversion with a comparator and for D/A output to the meter and Ultra-Stable Oscillator. 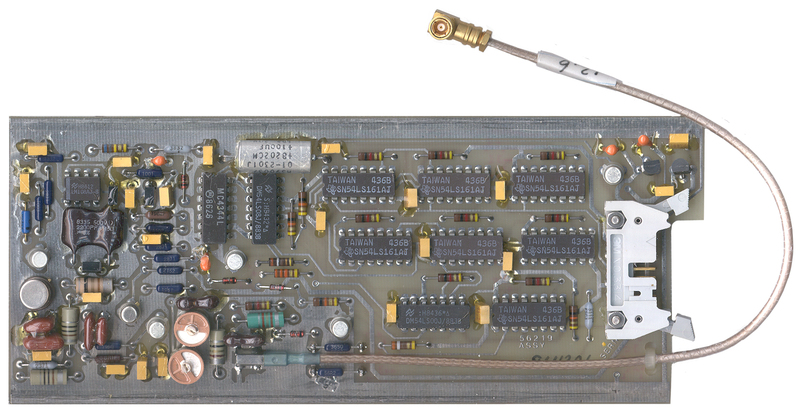 Directly under the A2 board is another same size board, the A1A4 12.6 MHz Synthesizer (56219 Assy) that shares the same 14 conductor ribbon cable and has a single coax cable that goes to the times 18 Multiplier. 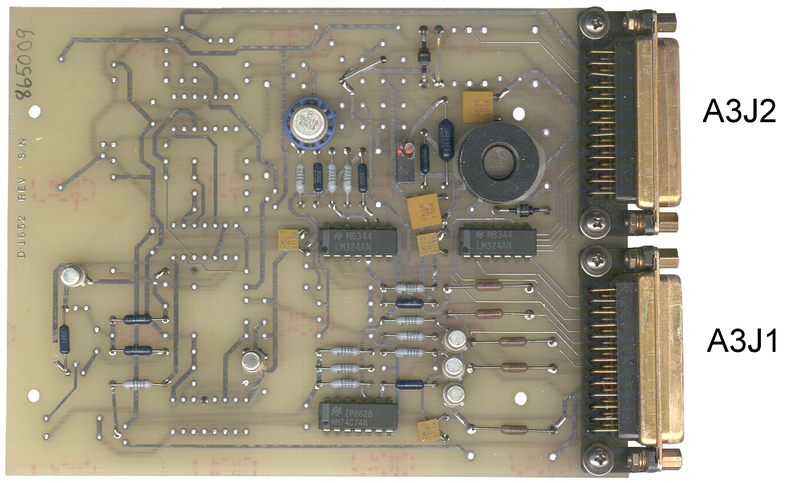 There are a half dozen Synchronous Four-Bit Counter 54LS161 ICs on this board. The tube is really straight, but the photo gives it a curved appearance because of perspective. The A1 Cesium beam tube is held at each end by an angle bracket that has 3 large philips screws holding it to the 5030 frame. One of these is under the A8 power supply and the other is under the A3 uP board. The x51 Multiplier and the Cesium Beam Tube Interface PCB are attached to the tube. coax with 180 MHz from A7 to X51 mult. Coax with error signal from interface board to A3 uP board. This board is where most of the wires coming out of the CBT are soldered. The E26 Test Point is missing. 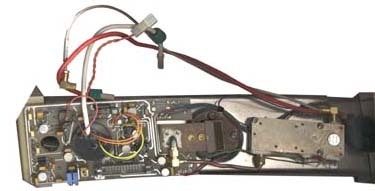 The wires coming from theDetector Heater are labeled along with the "E" number of the board terminals. 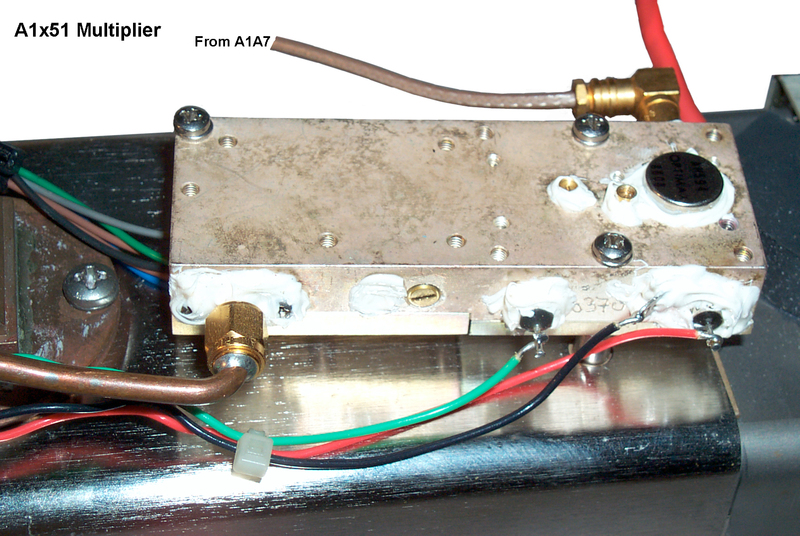 The x51 Microwave multiplier gets it's RF input from the A1A7 X18 Multiplier - Mixer and feeds it's output to the waveguide adapter on the CBT. The Red, Green and Black wires come from the CBT interface PCB. The PCBs are held by rails, but there are no card edge connectors on the PCBs. All connections are made by coldered wires, coax connectors (typcially standard 50 Ohm SMB), or rectangular connectors. There is an unused pair of rails above the microprocessor PCB, but if another board is used there it would ned to have notches to clear the to coax connectors coming from the uP board. At the same time press "Align" (behind the door) and "Operation Alarm" (next to the Monitor LED). This stops the control voltage from searching. Set the "Manual Scan" switch (behind the door) to "Control Voltage" and set the Monitor switch to 4 (control Voltage) and use the "Manual Scan Increase/Decrease" switch to center the meter. Set the "Manual Scan" switch (behind the door) to to "Loop Gain" and set the Monitor switch to 3 (Beam) and and use the "Manual Scan Increase/Decrease" switch to center the meter. Switch the "MOD" and "LOOP" switches back to On and Closed. In my case this caused the Lock LED to turn on and stay on. 26 Feb 2006 - Note after almost getting the C field set on s/n 1013, there was a power failure lasting about 2 seconds. But 1013 had been running for many months and was working well. After the power came back on the lock LED did not light. After giving it about 4 hours still with no lock light, the above procedure was used to set the control voltage and loop gain, and afterwards the lock LED turned on as soon as the closed loop and mod on switches were thrown. 28 Apr 2006 - You really can only center the Control Voltage using the front panel controls (as described above in the OPEN mode). When there's a continuous search or the yellow monitor LED is on with the green LOCK LED, then it's time to adjust the coarse frequency of the crystal oscillator. This can be done with the source locked. Remove the bottom cover and with the monitor switch in position 4 (CONTROL) note the reading. In my case it was over 3. Then adjust the coarse pot on the USO to bring the needle a little to the other side of 2.5, in my case to 1.6. When the control voltage gets closer to 2.5 the yellow monitor LED will go out leaving only the two green LED for LOCK and AC power. Hint: leave the door slightly open by turning the screw all the way out, closing the door and then turning the screw 1/4 turn. This way if the ALIGN lamp turns on you can see it. You could leave the door open, but for me it's in the way of other stuff. On the Cs Beam Tube Interface PCB there are 2 10-turn pots. The one close the the SMB connector is R9 and should not be changed. The one next to R9 is R5 and is the manual beam current adjust. It should be set so that the voltage between E23 (ground) and E26 (a test point) is 1.8 +/- 0.2 VDC. But I can't find E26 on my unit. Where is it? Also note in the photo there is a small screwdriver adjustment on top of the 10 MHz OCXO that has been relocated from the front so that you do NOT need to remove the 5030 Assembly to get access to this coarse adjustment pot. Serial Number 1013 has had the Green Lock LED on for about 3 hours. If the line cord is removed and plugged back in after 15 seconds the unit Lock LED turnes on in about 10 minutes. The manual implies that you can make the loop gain or beam current adjustments on the fly. But on the two occasions that I have tried to do that the FTS4060/S24 gets confused. The fix has been to pull the line plug for about 15 seconds and restart. Without the restart the control loop is oscillating. The Austron 2100T Timing LORAN-C receiver makes a good accessory. It provides a UTC clock, 1 PPS output and a check on the stability of the FTS4060. Also if the reference input fails the 2100T will break lock and need to be manually re started and so it's a good monitor on the output of the reference source. If you have one of the /S24 units would you tell me if you have the 10 MHz output and your serial number? When these units arrived on the truck the pallet looked just like this photo form the Government Liquidation auction, except that a sheet of cardboard had been placed over the pallet and then two metal straps over that. The FTS 4060 in the photo was never put back in it's box! Government Liquidation should have returned the instrument to it's box or the company that picked up the auction items should have, but it any case complete lack of common sense seems to have been the problem. Since this unit (s/n 1013) was already out of it's box, it's the first one tested. At first, because of the markings on the inside of the lid (dates of 1-27-88 <factory check out date>, 4MAY99, 5NOV90, 20FEB91 <user dates>) it appeared that this was not a new unit. But upon troubleshooting inside there was paper work indicting that the Cesium Beam Tube had been replaced in 1996 and so this really was an "A" condition code like new unit. The other two units (s/n 1033 and 1227) appear to be new old stock and lock up in 10 minutes and less than 30 minutes (was not watching when it locked). If at all possible pick up your unit rather that trust it to a freight forwarder or other third party that may not use common sense and/or good packaging methods. 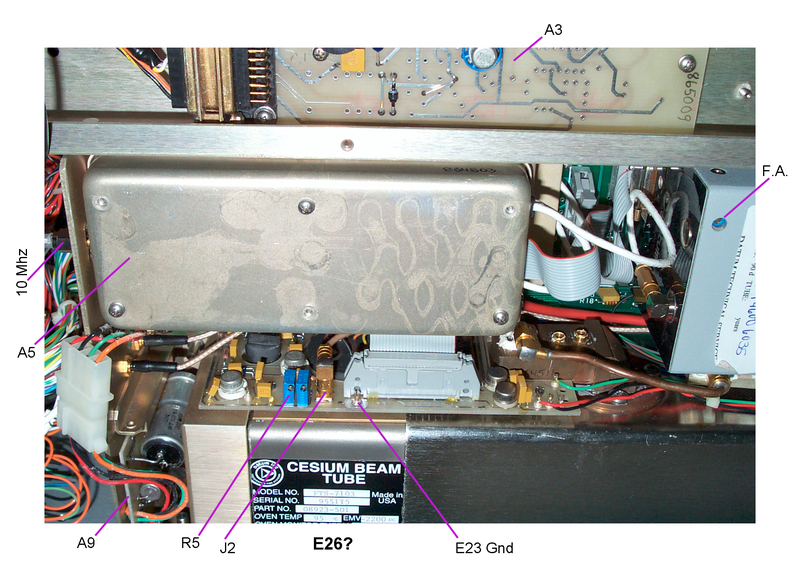 Most of the Cesium Frequency Standard units that are being sold by Government Liquidation (and on eBay) are condition code H7 which probably means that the tube has depleted all it's Cesium and is beyond economic repair (Symmetricom wants about $ 16,000 for a replacement tube plus shipping and installation fees), so look for condition code "A" units. If buying on eBay find out if the Lock light comes on (which might take an hour or two of operation). This sometimes can be seen in the product photo. The green Lock light is the upper left most indicator. 21 Jan 2005 - By using the manual procedure above to set the loop gain and control voltage I have been able to get the lock LED to turn on (and it will also do so after a power up) BUT the unit is NOT locked and the frequency is drifting consistent with a OCXO without any lock. So far I have not figured out what's causing this. Be warned a Green Lock LED may not mean the unit is operating properly. 8 Dec 2005 - After having all the sub assemblies of s/n 1013 taken apart for a few months while working on the manual and doing other things when it was put back toghther on 7 Dec 2005 (after a small manual tweak on the control voltage) the green Operation Lock LED turned on. The next morning it still is on. This is probably the same behaviour as seen on 21 Jan 2005 (scroll up a few inches) and may not mean that there is Cs lock. If this manual is of interest please let me know. I lost a lot of info on the FTS4060 in a hard drive crash. Symmetricom calls this product line Quantum Atomic Oscillators. 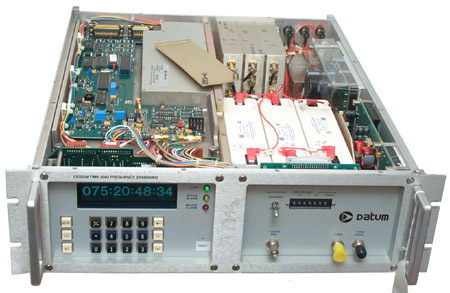 The second generation devices are the Chip Scale Atomic Clocks (CASC). The SA.45s uses a vapor cell with Cesium so it's not a primary standard. It has properties like a Rubidium vapor cell standard, but is very small and draws a small amount of power. “Hermetic vacuum sealing of MEMS devices containing organic components,” Proceedings of the SPIE, in press. “Chip Scale Atomic Clock Progress” Proceedings of the EFTF-IFCS Joint Conference, April 2009, Besançon, France. “Chip Scale Atomic Clock,” Proceedings of the The Seventh Symposium on Frequency Standards and Metrology, October 2008, Pacific Grove, CA, USA. “The Chip-Scale Atomic Clock – Prototype Evaluation,” Proceedings of the 36th Annual Precise Time and Time Interval (PTTI) Systems and Applications Meeting, November 2007, Long Beach, CA. “Atomic clocks throw down the gauntlet to VCSEL makers” Compound Semiconductor, August 2007, Vol. 13, No. 7. 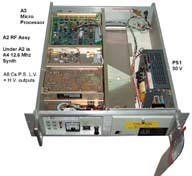 “The Miniature Atomic Clock – Pre-Production Results,” Proceedings of the 2007 Joint Meeting of the European Time and Frequency Forum and the IEEE Frequency Control Symposium, May 2007, Geneva, Switzerland. “Low-power, 4.6-GHz, Stable Oscillator for CSAC,” Proceedings of the 2006 Joint Meeting of the European Time and Frequency Forum and the IEEE Frequency Control Symposium, June 2006, Miami, FL. “VCSELs for Atomic Clocks,” Proceedings of the SPIE, vol. 6132. 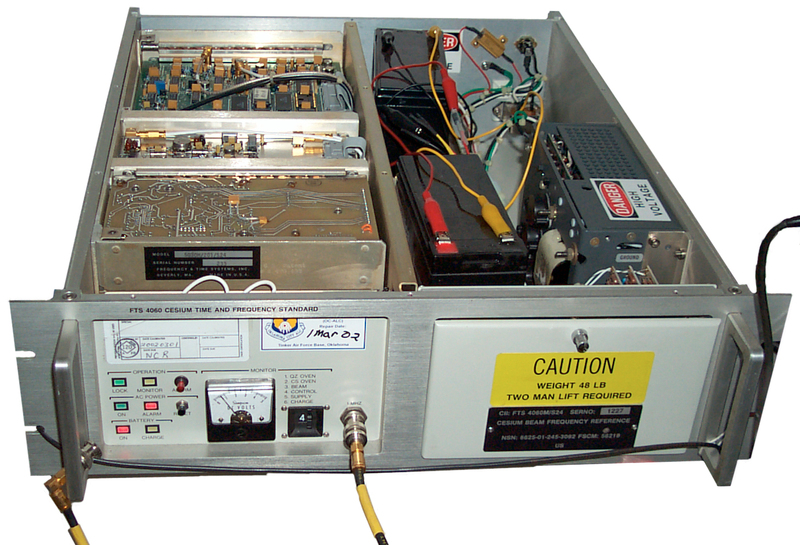 “The MAC - A Miniature Atomic Clock,” Proceedings of the 2005 Joint Meeting of the International Frequency Control Symposium and the Precise Time and Time Interval (PTTI) Systems and Applications Meeting, August, 2005, Vancouver, BC, Canada. “An Ultra-Low_power Physics Package for a Chip-Scale Atomic Clock,” Proceedings of the IEEE International Conference on Solid-State Sensors and Actuators, June 2005, Seoul, South Korea. “The Chip-Scale Atomic Clock – Low-Power Physics Package,” Proceedings of the 36th Annual Precise Time and Time Interval (PTTI) Systems and Applications Meeting, December, 2004, Washington, DC. “The Chip-Scale Atomic Clock – Recent Development Progress,” Proceedings of the 35th Annual Precise Time and Time Interval (PTTI) Systems and Applications Meeting, December, 2003, San Diego, CA. “The Chip-Scale Atomic Clock Coherent Population Trapping vs. Conventional Interrogation,” Proceedings of the 34th Annual Precise Time and Time Interval (PTTI) Systems and Applications Meeting, December, 2002, Reston, VA.
Self Winding Clock Co "Western Union" & another page & related Patents - ? [an error occurred while processing this directive] page created 18 Aug 2004.